Loretto Dempsey has Motor Neurone Disease (MND). In April she recorded Radio Adverts as part of a National Awareness initiative, kindly supported by SuperValu and Dublin Bus. The campaign aims to draw people’s attention to the difficulties someone with MND faces every day. Loretto is 50 years old and only last March she was diagnosed with MND. Loretto used to be a baker for over 10 years. She would spend all day in the kitchen, lifting bags of flour and making treats to feed an army. Now she can’t move the fingers on her left hand and needs somebody to chop up her dinner and feed her. “I am the same person I always was, I just know that I will be dead in a couple of years. Everyone has to die of something and if I had a heart attack I would be gone already. Just because I can’t physically do things doesn’t mean I can’t still enjoy what I can do. You can’t say “Actually I don’t want MND. I want to give it back thanks, I kept the receipt”, Loretto. You can organise a Drink Tea for MND event throughout the month of June. SuperValu have very generously sponsored the Tea packs so to register your event and to get your free SuperValu Tea pack, please email fundraising@imnda.ie or Freefone 1800 403 403. Listen out for the Radio adverts that will be airing from the 8th – 21st June and also keep an eye out on Dublin Bus for our awareness posters which will be visible from 5th – 19th June. For more information please contact the Communications & PR Dept. 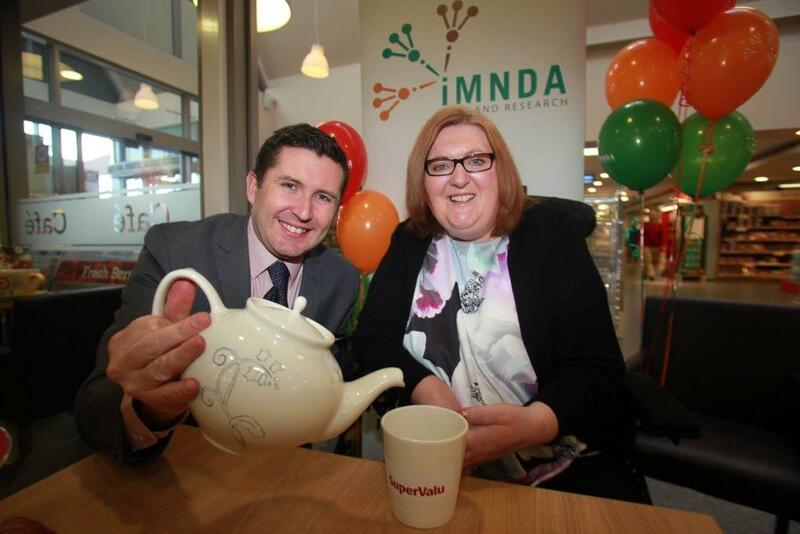 The Irish Motor Neurone Disease Association (IMNDA) is the only organisation of its kind in this country. It was set up in May 1985 to provide care and support to people with Motor Neurone Disease, their carers, families and friends. There are currently over 320 people living with MND in Ireland. MND is often referred to as the 1,000 day disease as most people die within 1,000 days of being diagnosed.